Alfred Burgers & Vins is an eco-friendly café, bar, restaurant made in Burgundy where the best local products are used to cook up burgers, soups, salads and desserts all 100% homemade. You get to taste this in a relaxed atmosphere with a homelike system where you order at the counter and then relax while we serve you. This way you can fully enjoy the décor which was sensibly created with recycled goods because at Alfred we are strongly committed to sustainable development and respecting the environment. 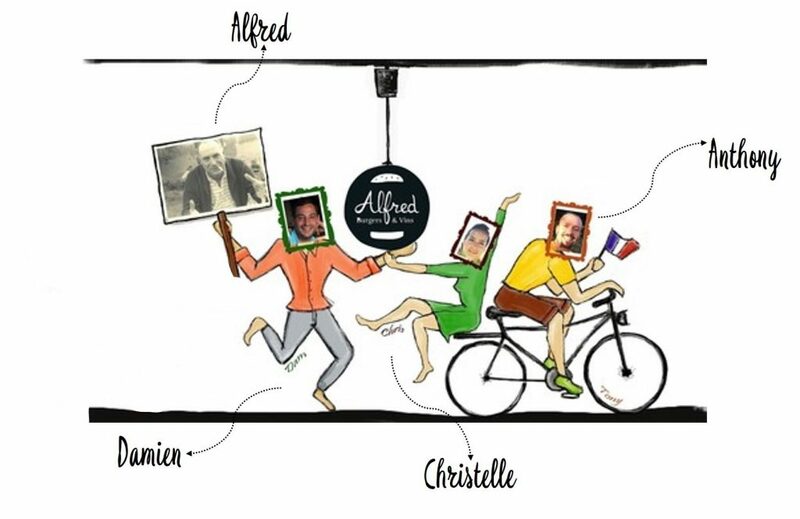 Alfred Burgers & Vins is one big family story. Damien Troussière (Dam): Owner, passionate about cooking and the restaurant industry, inspired by his experience in the United States. Christelle Ashkar (Chris): Damien’s wife and co-owner…they met in Los Angeles. She is in charge of the fresh fruit & vegetable juice production, working with the local producers, and the restaurant’s marketing & communication. Anthony Pinard (Tony): Damien’s childhood friend…and friends are like family. An engineer’s soul and passionate about travels and adventures. Alfred: He was Dam’s grandfather. A man with a heart of gold and godfather of the Meilleurs Ouvriers de France. He appreciated a job well done, was a true butcher and cold cuts expert and knew the best farmers of the region to offer his clients premium quality meat. A true epicurean and lover of his local land’s produce. During his time, life was good, the food was good, and the wine was good.